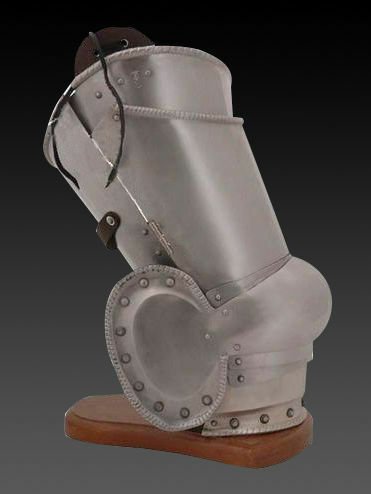 Plate thigh protection of the XVI century is also known as cuisses. 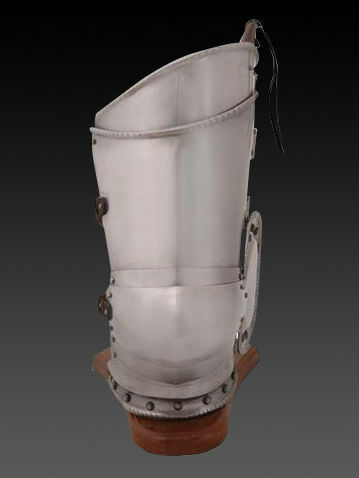 This late medieval leg armor was in use among knights of all military branches. Metal leg defense is additionally equipped with kneecaps with fan, which protect outer side of knee. Closed cuisses with hinges and leather belts and buckles for fastening cover the entire thigh and completely protect it. There are leather loops with holes are installed on the upper part of cuisses, so you may easily fasten this medieval leg armour to your padded doublet. In options, you may choose another type and thickness of metal, color of belts, finish treatment and decoration for your steel leg protection. If you are looking for another model of late medieval leg protection, so you might like full plate legs, a part of garniture of George Clifford, end of the XVI century. Plate legs of the XIV-XV centuries are a part of Churburg style full-plate armor. Leg armor of the 1410 year, Churburg castle Cuisses (thigh protection) are reinforced with a rib in the center. Kneecaps are supplied with a fan, which covers outer side of knee. Upper part of armor has leather loops for fastening of cuisses to the medieval doublet of belt. You may complete your medieval plate leg protection with closed hinged greaves and plate sabatons. You can use this battle metal leg armor for: SCA HEMA Larp Stage performances Medieval festivals Reenactment events Base price includes following options: Cold-rolled steel 1.0 mm; Satin polishing; Brown leather belts; Steel nickel-plated buckles; Steel rivets; No decoration; Painting inside; Knee fan of style 1 Main photo shows functional medieval plate cuisses with following options: Cold-rolled steel 1.5 mm; Satin polishing as finish treatment; Brass rivets; Brass buckles; Brown leather; Painting inside..
Closed hinged greaves of the 1450-1485 years were an important part of armored outfit of any medieval knight. Simple and practical design, comfort in wearing and full protection of calf were making this shin guard a high-demanded armor. These medieval metal greaves have hinges and leather belts with buckles for fastening and keeping them on the shin. Plate greaves of the XV century, Italy Closed greaves of the XIV century, Musée des Beaux Arts, Chartres, France Plate greaves are recommended to use together with cuisses (thigh armor) for complete leg protection. You can use this functional metal leg armor for: SCA HEMA Larp Stage performances Medieval festivals Reenactment events Base price includes following options: Cold-rolled steel 1.0 mm; Satin polishing; Brown leather belts; Steel nickel-plated buckles; Steel rivets; No decoration; Painting inside Main photo shows authentic medieval plate closed greaves with following options: Cold-rolled steel 1.5 mm; Sat..
Complex knee protection is an essential element of medieval battle outfit of every knight. First models appeared in the XIII century. Kneecaps (poleyn) of various shapes were used together as with brigand or plate leg armor, so over the mail stockings. 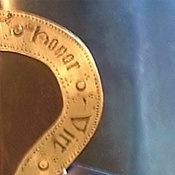 This element could be worn as independent piece of medieval leg armor, so as a part of solid metal legs (cuisse). Numerous effigies, miniatures, paintings and other historical sources show us knights, wearing such joint armor. Thigh and knee defense, a part of an Armor of Sir John Scudamore, XVI century, the Metropolitan Museum of Art, New York, USA Articulated poleyn, Musée des beauxm arts, Chartres, 1380 year This model includes kneecap with rondel and articulated segments over and under the poleyn for better protection of joint. Poleyn is reliable held on your knee with firm leather belt and buckle. You can use these functional kneecaps for: SCA HEMA Larp Stage performances Medieval festivals Reenactment events Base price includes follo..